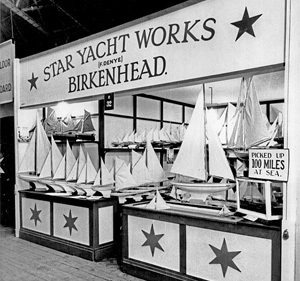 Amongst the many independent British model yacht manufacturers of the 20th century Star Yachts of Birkenhead stand out as being the most prolific. Their iconic products were essentially toys, when compared with the more expensive models manufactured by the likes of Bassett Lowke (themselves a retailer of Star Yachts) but, for many, they represented the epitome of the traditional English childhood seaside summer holiday. The history of the Star Yacht company, including the varied products it manufactured over a period of almost 70 years, is a fascinating one and it’d be a shame if it all became lost over time. I have, since childhood, been an admirer of their products and, more recently, I have had the good fortune to have been allowed access to much archive material not only from the Denye family themselves but also from others who managed to salvage records from the factory as the bulldozers, quite literally, began flattening the site in 1991. Please note that the majority of images on this website can be viewed in greater detail simply by clicking on them. 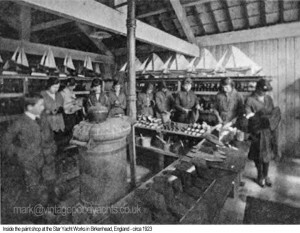 Arriving in England “penniless and homeless” Franz, who knew only a few words of English, managed to find himself employment throughout the war at the yards of Clover Clayton and Rutherford’s in Birkenhead where, no doubt, his skills as an expert shipwright were in great demand. 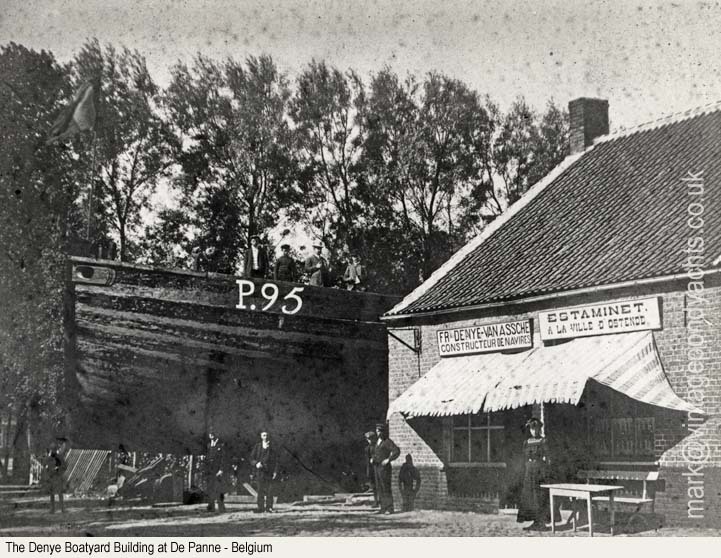 When the Armistice finally came it was clear that the family business in Ostend had, together with their property, been destroyed taking with it all hopes of returning home and so the decision was made for them to remain in England. 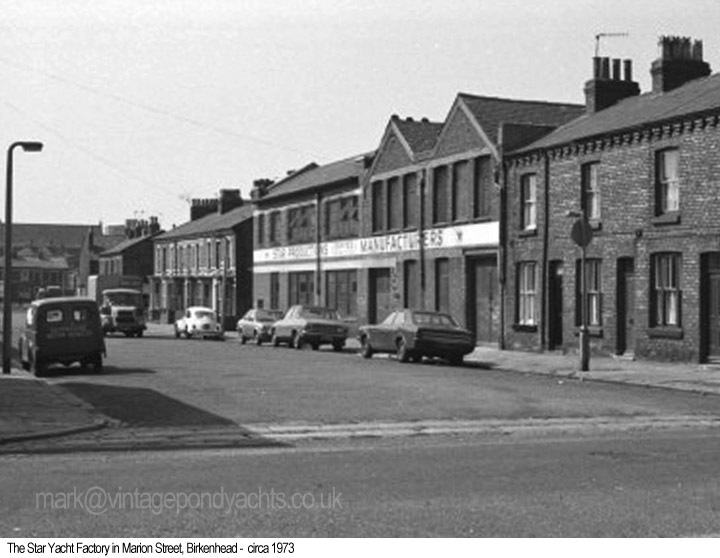 The family took on a small back street shop in Birkenhead from which Marie sold cooked meats whilst Franz, when not employed in the shipyards, would settle himself in a back room and carve the “little model yachts” that were destined to make their fortune. Initially his models were only offered alongside the meat products in their little shop but word soon spread and it wasn’t long before the demand for them increased and he, ably assisted by Ma rie who sewed the sails, found himself busy supplying various different retailers throughout the area. Franz knew the importance of building his business and so, whilst for the next two years the family lived very frugally off the proceeds of the cooked meats, he reinvested the small profits he made by purchasing better tools, supplies of wood and paint that would allow him to begin the slow transition into mass production. 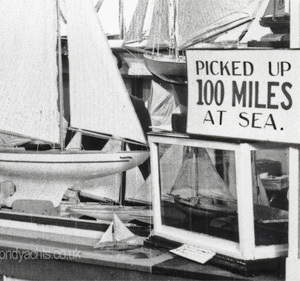 Alongside this increase in production Franz was able to seek out agents that could promote his models to retailers in major cities and it wasn’t long before the orders came flooding in for thousands of toy yachts. 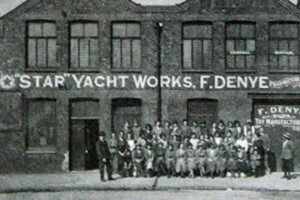 In 1922, encouraged by the huge surge in sales, Franz took the decision to set up a factory in Marion Street, Birkenhead – an address that was destined to become synonymous with Star Yacht production for almost 70 years. 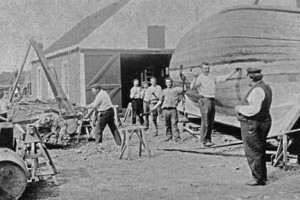 “I acquired a workshop in Marion street, installed lathes and other light machinery, and for a time my wife, myself, and elder children worked very long hours for six days a week. Still the orders increased. 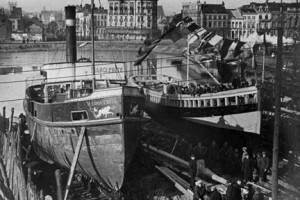 More machinery followed and then we engaged young women and girls from the district, departmentalising the making and fitting of masts and sails under my wife’s supervision, and the hulls under mine. 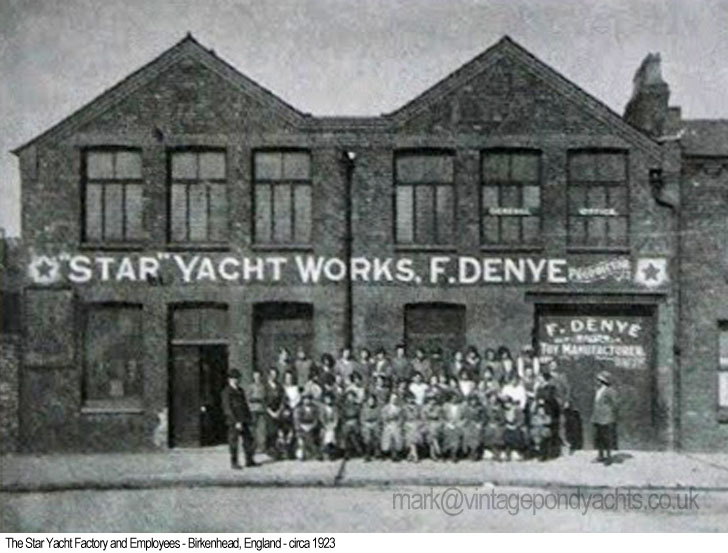 The images below show the “Star Yacht Works” in Marion Street. 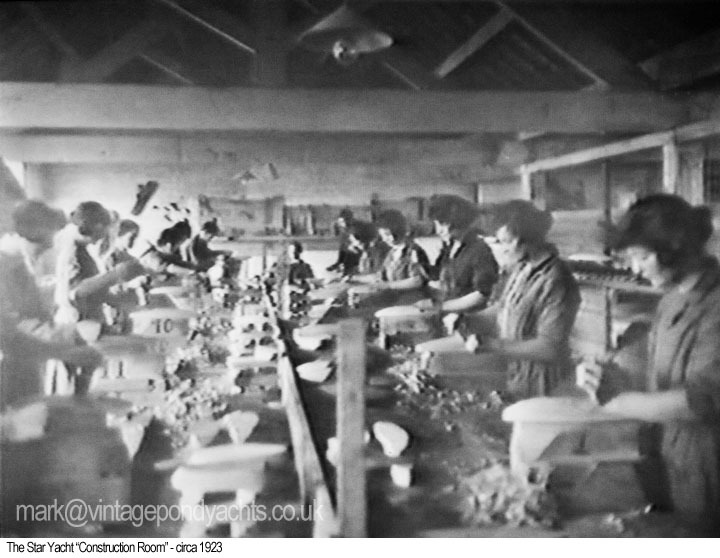 The first was taken circa 1923 and shows the factory and staff with Franz, wearing his trilby hat, stood to the left of the group whilst to the right is his wife Marie. 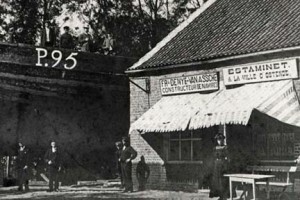 The second image shows the factory as it was circa 1931 and the two gentlemen stood outside the entrance are Jean-Jacques and Ferdinand-Andre, two of the sons of Franz Denye, who were destined to later take over the running of Star Productions until the 1960’s. The overwhelming success of the business, together with the necessary expansion required to cope with the demands in manufacturing, meant that in 1937 land adjoining the site was purchased and the factory extended. Further expansion was possible when, in the early 1950’s, the company was able to purchase an old builders yard located behind the factory. 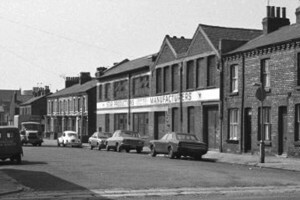 The third image, taken in the early 1970’s, shows the extent of the development along Marion Street and it was to remain like this until the sad closure of the factory for redevelopment in 1990. The following quote gives a good insight into the workings of the factory itself. “Inside the mysterious, dark buildings of Star Productions, the traditional skills of its craftsmen are jealously guarded. Few people are allowed through the locked doors except the company’s faithful employees. The air hangs heavy with the pleasant smells of freshly-planed wood, yacht varnish and paint. Along a labyrinth of passages, resembling below decks of a ship, the partly-made hulls of countless small-scale yachts await the craftsman’s touch”. 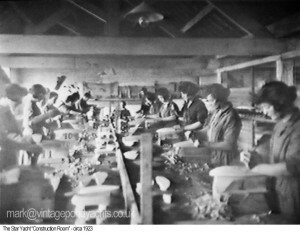 The photographs below show factory life as it was in around 1923 and, although the images are poor, it’s possible to see how well organised the whole production line had become. The first image shows what was known as the “construction room” and you can just make out the 12 numbered workstations beginning with No 1 in the foreground on the right hand side. 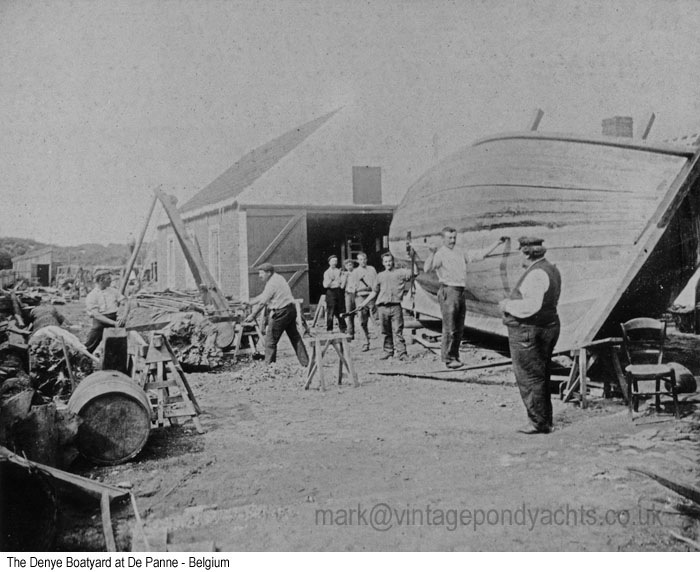 Throughout the early years production was extremely labour-intensive with each individual yacht being carved, by hand, from a solid rectangular block. It was only after this time, with the introduction of semi automatic lathes and then later fully automatic lathes, that production became simpler and more efficient. 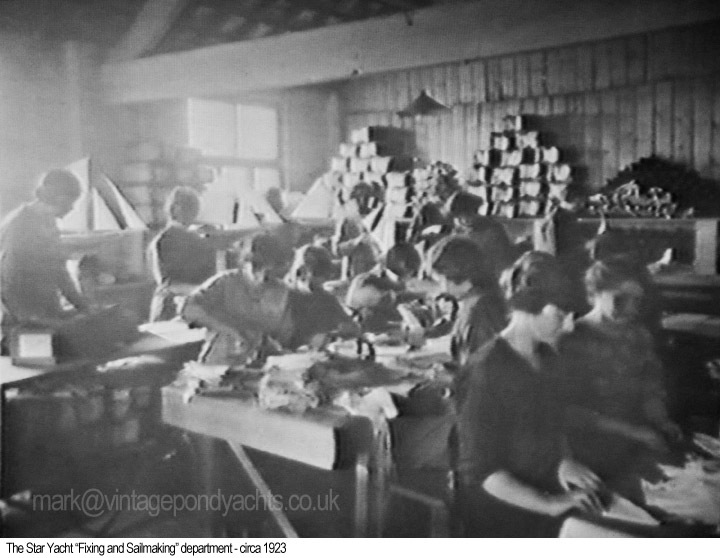 The third photograph depicts the “fixing and sail making department” and it seems clear, from the cramped nature of the workstations, that business was indeed booming at this time. It’s interesting to note that all the work areas depicted above are located on the first floor of the Star Works building so, given the lack of evidence to the contrary, one can only assume that the ground floor was used for the storage of both raw materials and the finished stocks of yachts ready for dispatch. 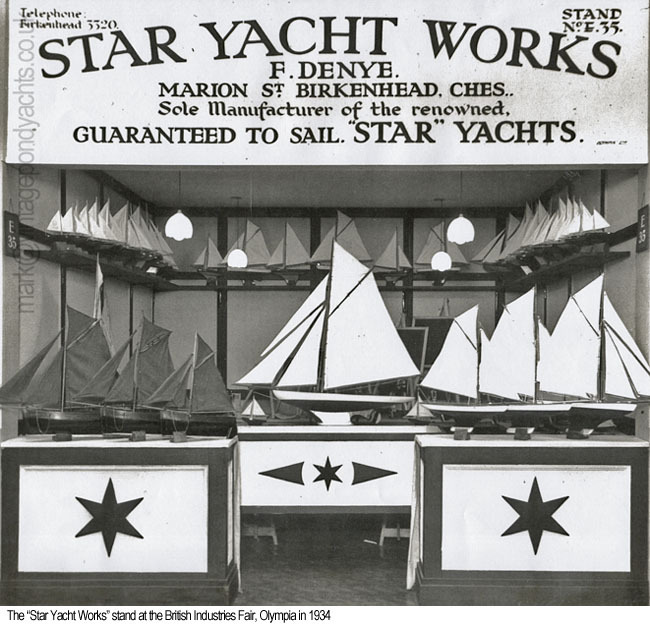 The earliest reference that I’ve been able to find, relating to the products of the “Star Yacht Works”, are three post cards that were almost certainly used as commercial advertising material in the 1920″s. 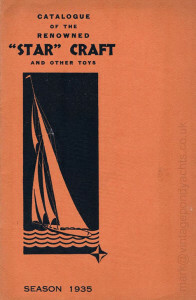 The first depicts an early model Fishing Smack and, as can be seen from the images below, although it share similarities to models shown in 1930’s catalogues (and contemporary models produced by Star that were retailed under the Tri-ang banner) there are subtle differences such as the omission of portholes. The second and third postcards depict early examples of their popular “Solid Yachts” and show the original keel shape before the introduction of the more distinctive curved keel that featured from the early 1930’s right up until the factory finally ceased production in 1991. 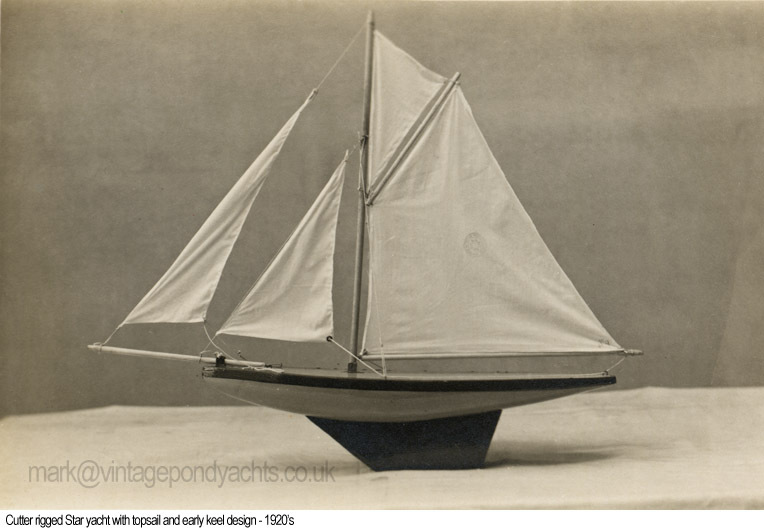 Another distinctive feature of the early yachts is the much shallower, hand carved hull which preceded the deeper, machine turned forms of the later models. 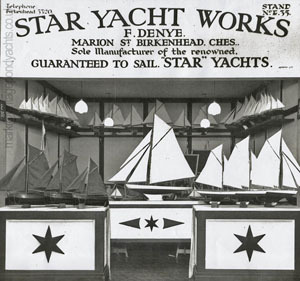 Early advertising postcards for the “Star” yacht works in Birkenhead, England. 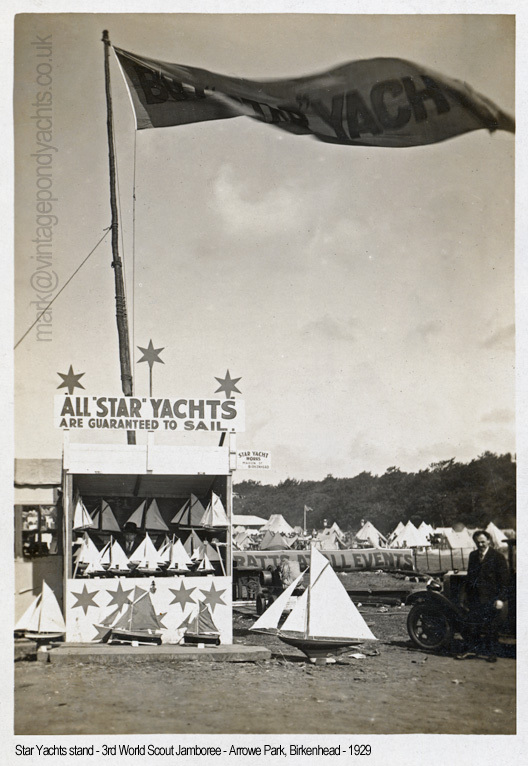 In the summer of 1929 the 3rd World Scout Jamboree, held at Arrowe Park just to the west of Birkenhead, allowed Franz the opportunity of showcasing his Star Yacht companies ever expanding range of pond yachts to a world wide audience. 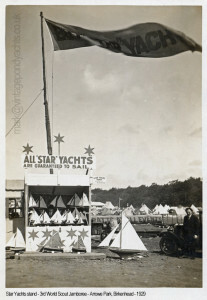 This 15 day event, which was attended by some 30,000 Scouts and over 300,000 visitors, featured a “Star Yacht Works” exhibition stand complete with a flagpole flying a huge flag with the, none-too-subtle, wording “BUY STAR YACHTS”. 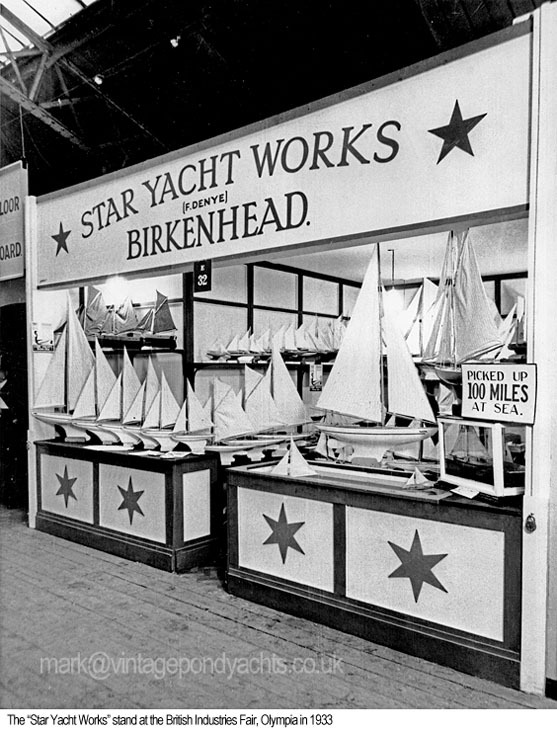 The stand itself proudly boasted “All Star Yachts are Guaranteed to Sail”, a clever tagline that featured from the companies early days right up until the factory closure. Although the image is fairly poor it is possible to clearly identify, amongst the many yachts offered, two Fishing Smack models in the foreground and what appears to be a large Racing Cutter to the right of the stand. It was on a fine August morning in 1932 that the Master of the steam trawler Swan, a Captain C A Evans, spotted a tiny object bobbing up and down on the waves of the Irish Sea. 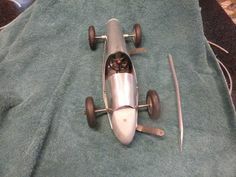 As his vessel drew closer both he and his crew were surprised to discover that it was a toy yacht, its sails set as it majestically charted its course. 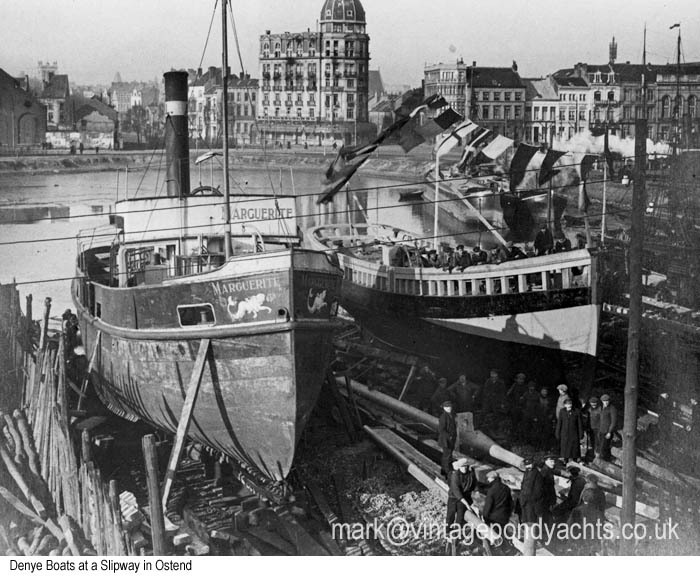 “A remarkable sea voyage by a child’s toy yacht only 15 inches long, was revealed when the Fleetwood steam-trawler Swan arrived in port yesterday. 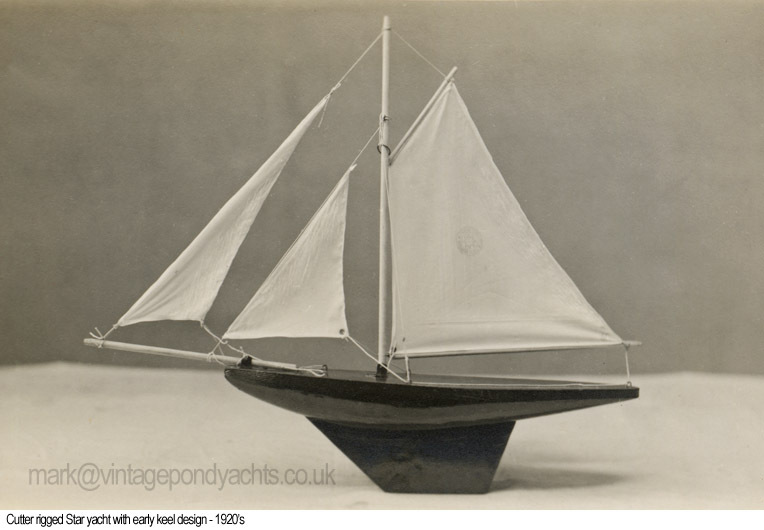 While in the vicinity of the Calf of Man, Skipper C A Evans observed a small object sailing bravely along and, steaming closer, discovered that it was a toy yacht, with all sails set and in perfect condition. An address at Bangor, County Down, was found on the sail, and it is presumed that the yacht’s child owner had been paddling at the resort with the yacht when it was carried away to sea. That so small a yacht could weather a voyage of nearly 100 miles without being swamped or battered to pieces is considered remarkable among the deep-sea fishermen who inspected it at Fleetwood yesterday. 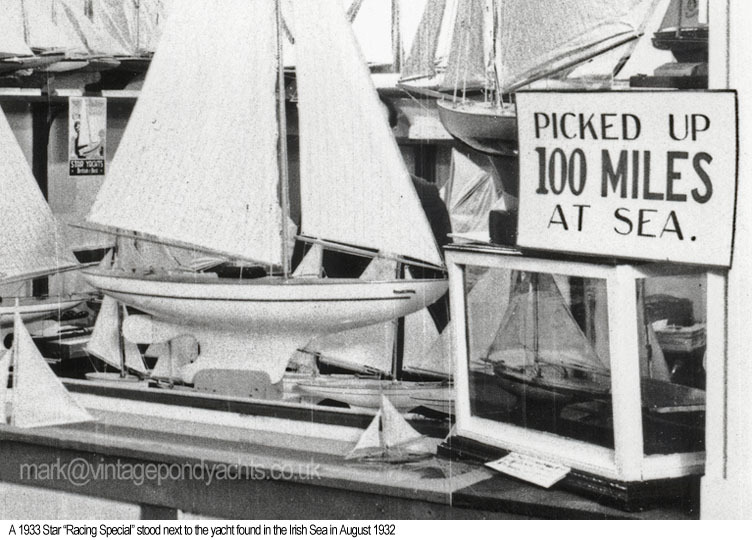 The yacht was clearly identifiable by the Star logo which was, alongside the name of the retailer in Bangor, emblazoned on the mainsail and Franz, ever the businessman, seized the advertising potential that such a story could bring in order to promote his products. 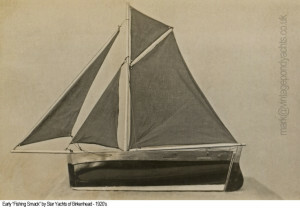 Although attempts were almost certainly made to trace the young owner of the vessel it is unlikely that they were ever reunited with their pride and joy, instead the yacht was returned to the factory where a bespoke glass cabinet was constructed for it and it was to take pride of place on the front of the Star Yacht Works stand at the British Industries Fair, Olympia in 1933. 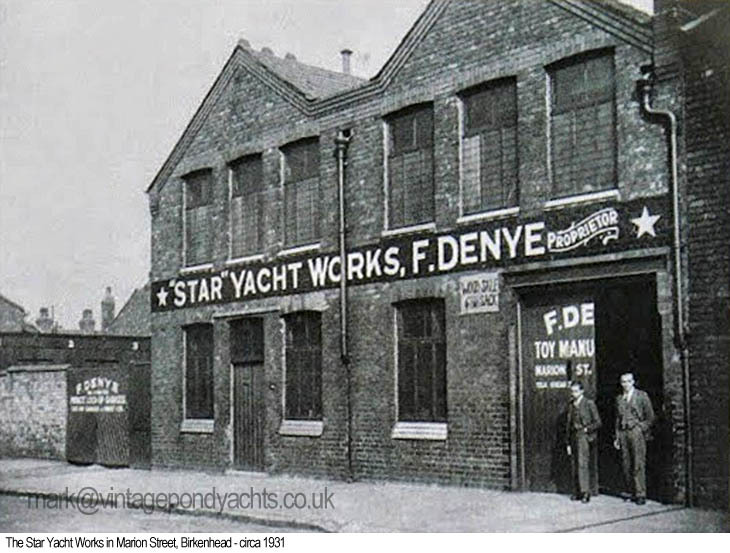 “A substantial increase in trade during the past twelve months has been responsible for a considerable expansion and development in the output of the “Star” Yacht Works, Marion Street, Birkenhead. 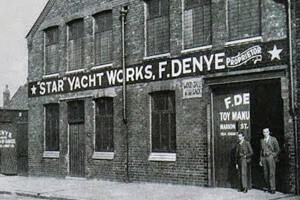 Controlled by Mr F. Denye and family, the business takes the form of the manufacture of wooden toys and, up to the present, has employed eighty people. During the past year business has increased to such an extent as to make it impossible to cope with the output and, in the New Year, the number of employees is to be brought up to over 200 and the premises enlarged. The firm sends its goods all over the world and is the only one in Birkenhead to be represented at the British Industries Fair”. The catalogue of 1938 boasted a range of no less than 38 different yacht variants and alongside these were also offered 6 clockwork speedboats, a Star steam launch, 2 Star electric launches and 3 clockwork Star cargo steamers. Although yachts formed the mainstay of the companies business, the changes in seasonal demand for such products was managed by the production of other wooden toys – wheelbarrows, carts, blackboards, easels, bagatelle boards and billiard tables, to ensure the ongoing economic well-being of the factory.